August 8, 2017 – An ozone-measuring instrument that launched to the International Space Station in February has completed commissioning and is now collecting atmospheric data. The Stratospheric Aerosol and Gas Experiment (SAGE) III, which was developed at NASA’s Langley Research Center and built by Ball Aerospace of Boulder, Colorado, collected the preliminary data pictured above over the western desert of Iraq from its perch on the exterior of the space station. The instrument measured ozone levels from the mesosphere, stratosphere and through most of the troposphere, as clouds permitted. The relative smoothness of the profile line reflects the quality of the SAGE III data. 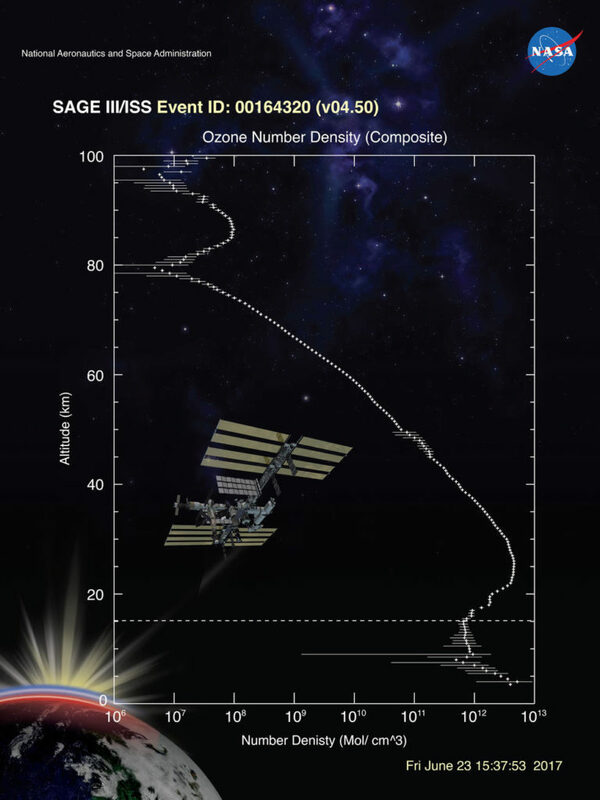 “The ISS program congratulates the SAGE III team on the achievement of this critical milestone, and we are pleased to contribute to the continuation of the SAGE dataset of ozone measurements as the hosting platform for the instrument, which likewise demonstrates the usefulness of the ISS as a remote sensing platform,” said William Stefanov, associate space station program scientist for Earth observations. SAGE III is the continuation of a legacy of ozone-measuring instruments that go back to 1979 and the launch of SAGE I. SAGE II launched aboard the Earth Radiation Budget Satellite in 1984. Data from that instrument helped inform the Montreal Protocol, an international treaty that banned the use of ozone-depleting chlorofluorocarbons. SAGE III will monitor the recovery of the ozone layer, which helps protect the Earth from cancer-causing, crop-damaging ultraviolet rays. With the instrument now in routine operation, the science team at Langley plans to implement improvements to data quality and expects to release a more comprehensive, informative data package to the public later this year.